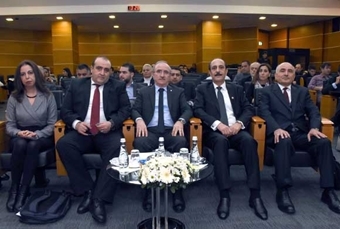 Istanbul Chamber of Industry (ICI) organized Jordan Country Day and Opportunities for Turkey with the goal of introducing investment and cooperation opportunities in Jordan that has an important location in the Middle East market. To the event that was hosted in Odakule by ICI Accounting Member of Board of Directors Sadık Ayhan Saruhan and honored by the participation of Jordan Ankara Ambassador Ismail Rifaie, a lot of industrialists and other participants looking for business and investment opportunities in Jordan and neighborhood had attended. ICI Accounting Member of Board of Directors Sadık Ayhan Saruhan made the opening speech of the meeting, stating that Jordan is one of the rare countries of Middle East that lacks petroleum and natural gas resources even though it has a geographically strategic location. Saruhan said that the Jordan economy that is heavily based on import has a huge potential for the Turkish industrialists. Reminding that the relations between Turkey and Jordan are based on the "Treaty of Friendship” signed on 11 January 1947, Saruhan said that Amman Consulate General is active since 28 April 1947 and that the legal infrastructure of the bilateral relations had been established with more than 40 agreements and memorandums of understanding that had been signed with Jordan until today. Reminding that one of the most important phases of the economic relations between two countries was Turkey-Jordan Free Trade Agreement that was put into practice on 1 March 2011, Saruhan explained that this agreement aimed to increase and strengthen the economical, technical and industrial cooperation between the respective parties, removing the restrictions in merchandise trade, creating suitable competitive conditions, encouraging mutual investments, and improving the trade and cooperation of the parties in third country markets. Saruhan stated that the trade relations between two countries had recently gained speed thanks to this free trade agreement containing regulations in various fields extending from agriculture to industry. Expressing their respect to the decision of Jordan government to suspend the agreement few days ago, Saruhan wished for the trade relations to get back to normal in short amount of time. Saruhan also talked about the trade volume between two countries. "Looking at the economic data between two countries, the current trade volume between Turkey and Jordan is around 795 million dollars with 682 million dollar export and 113 million dollar import for Turkey as of the end of 2017. The goods that have the highest share in trade between two countries are iron-steel byproducts, petroleum products, tobacco and its products, wood products, pulses, air-conditioners, iron-steel construction parts, paper and iron-steel products in our export, and chemicals, iron-steel and textile-garment products in our import." said Saruhan. Naming Jordan as an important gate for Turkey's entrance to the Gulf countries as a country right at the heart of Middle East, Saruhan recorded that Jordan is a very important country for them due to both the friendship and brotherhood relations going back many years and its political and economic interest coinciding with Turkey's in a geography that currently goes through significant changes. Jordan Ankara Ambassador Ismail Rifaie also made a speech during the opening of the meeting and shared his wishes to improve the current relations between two brother countries further. Reminding that the free trade agreement that had been in force since 2011 was suspended by the Jordan government few days ago, Rifaie stated that this is only temporary and that the agreement will put it back into force soon. Rifaie said that they want to benefit from the experience and knowledge of ICI for the Jordan economy, and Turkish companies can expand to the Gulf and African markets by investing in Jordan. Telling that significant investment opportunities had arisen with the incentives provided in Jordan, Rifaie stated that they believe Turkish industrialists and investors will prefer Jordan because of its geographical location. Then, a panel titled 'Cooperation and Investment Opportunities in Jordan Market' was held. Amman Former Trade Consultant Hüseyin Demir, who gave a speech in the panel, stated that there are many issues in the region leading to the unhappiness of its people and these issues can only be solved with investment, production and new lines of business. Stating that Jordan continues its stable growth even though it is not a very big economy and do not have big growth rates, Demir underlined that this should also be reassuring for the potential investors. Demir said that there are no political issues between two countries and that this is also an opportunity, and added that Jordan also has an education system that attracts a lot of students from the Gulf countries. Jordan Ankara Consulate General, Economic Relations Undersecretary Dr. Emad Masalmeh stated that Jordan has a geographical location that no other country can easily have. Underlining that Turkish goods are known with their quality both in Jordan and other countries in the region, Masalmeh stated that Jordan has free trade agreements with many countries including USA, Canada and Singapore, and thus the manufacturing industrialists will not face the customs barrier while entering into other country markets. Providing the information that there are tax immunity and field allocation opportunities in investment regions, Masalmeh stated that the country receives sun light 330 days of the year and thus offers great opportunities for investments in solar energy. Following this panel, another panel titled "Experiences of Turkish Companies in Jordan Market" moderated by ICI Deputy Secretary General Haktan Akın and honored by the participations of Gama Energy Vice General Manager Ahmet Burak Kadıoğlu, Arçelik Middle East Export Manager Oral Bozkurt and Assan Panel Trade Vice General Manager Arın Demir was held. After sharing their experiences about investing in Jordan, the panelists answered the questions.